The Chevron-operated Wheatstone Project is one of Australia’s largest resource developments and the nation’s first liquefied natural gas (LNG) hub – providing greater security of energy supply as well as significant economic benefits such as employment, government revenue and local business opportunities. Wheatstone’s onshore facilities are located 12 kilometres (km) west of Onslow on the Pilbara coast of Western Australia. The foundation project consists of two LNG trains with a combined capacity of 8.9 million tonnes per annum (MTPA), and a domestic gas plant. The project was sanctioned in late 2011, with first shipment of LNG announced in October 2017. The Wheatstone and nearby Iago natural gas resources are located about 225km north of Onslow off Western Australia's Pilbara coast. The Julimar and Brunello fields also tie back to the central processing platform. In conjunction with the Gorgon Project, Wheatstone reinforces our position as a leading natural gas supplier and LNG operator in the Asia-Pacific region. The Wheatstone Project is a joint venture between Australian subsidiaries of Chevron (64.14 percent), Kuwait Foreign Petroleum Exploration Company (KUFPEC) (13.4 percent), Woodside Petroleum Limited (13 percent), and Kyushu Electric Power Company (1.46 percent), together with PE Wheatstone Pty Ltd, part-owned by JERA (8 percent). Follow the journey from construction to first LNG production and cargo. With a predicted lifespan of 30 years, Wheatstone is one of Australia’s most significant resource projects and is making a substantial economic contribution to the long-term future of the nation through jobs, government revenues and local goods and services. To date, more than $20 billion has been committed to Australian companies since construction started in late 2011. In addition, the Wheatstone Project has bolstered the economy through local employment directly employing more than 7,000 workers during peak construction. Collectively, the Gorgon and Wheatstone natural gas projects have committed more than $60 billion to the Australian economy, with more than 900 contracts awarded to Australian companies. The Wheatstone Project's offshore processing platform is located in 70 metres of water, about 225km from the coast. The offshore facilities gather and partially process gas and associated condensate from the Wheatstone, Iago, Julimar and Brunello gas fields, and deliver it onshore via trunkline for further processing. Once onshore at Ashburton North, the majority of Wheatstone's gas is processed by the two LNG trains, where impurities and inert gases are removed and the natural gas is chilled to minus 130 degrees Celsius, at which point it flashes over to a liquid 600 times the density of the natural gas. It is further cooled to minus 162 degrees Celsius and sent to insulated storage tanks to await export overseas via LNG tankers. Natural gas from Wheatstone’s 200 terrajoule per day domestic gas plant will be delivered via pipeline to an inlet point on the Dampier Bunbury Natural Gas Pipeline. Once operational Chevron Australia will become one of the major suppliers of domestic gas in Western Australia. 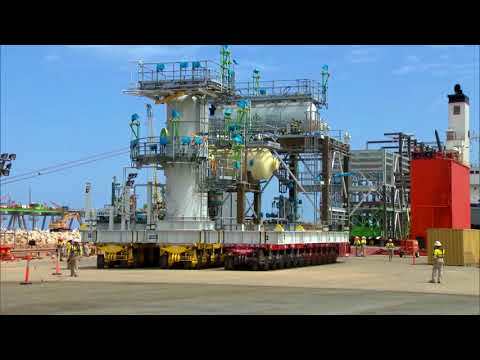 The Wheatstone LNG Plant at Ashburton North, Western Australia. The Wheatstone Platform is one of the largest offshore gas processing platform ever installed in Australia, with a topsides weight of about 37,000 metric tonnes. 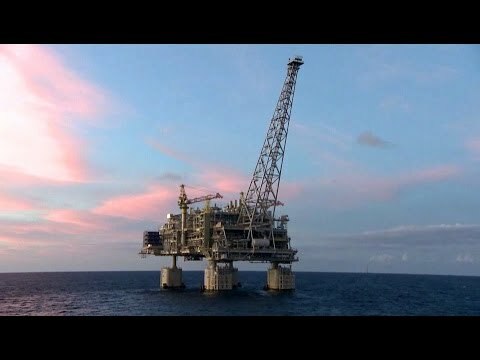 Watch the successful completion of the largest float-over installation Chevron has ever delivered globally. Chevron Australia is proud of the relationships we have built over more than 60 years of exploration and production in Western Australia. In Onslow, the town closest to the Wheatstone Project, we are working with the local community to deliver lasting benefits. Together with the Wheatstone joint venture participants, we recognise contributing to the local community beyond our direct operations can build better and stronger communities, enhancing the quality of life for those who live and work in the Pilbara region. In partnership with the Western Australian State Government, we are making significant investments over many years in and around Onslow. The Wheatstone Project has contributed more than $250 million to social and critical infrastructure projects, including upgrades to the airport, health services, roads, recreation facilities and utilities. Chevron Australia discovered the Wheatstone offshore gas resource in 2004, about 200 kilometres north of Onslow in the Greater Gorgon Area. In March 2008, we announced our intention to develop Wheatstone via an onshore liquified natural gas plant at Ashburton North, with a final investment decision to proceed made in September of 2011 and construction commencing in December 2011. The Chevron-operated Wheatstone Project achieved first LNG production and shipped its first cargo in October 2017. Around 85 percent of our equity LNG from the Wheatstone Project has been committed to buyers in Asia. These agreements include JERA (4.1 MTPA), Kyushu Electric (0.7 MTPA) and Tohoku Electric (0.9 MTPA). Chevron Australia has also signed an additional SPA with JERA for 0.4 MTPA of LNG from the Wheatstone Project. In addition, JERA, through a related company, has acquired from Chevron Australia a 10 percent participating interest in the Wheatstone field licenses and an eight percent interest in the Wheatstone natural gas processing facilities. Kyushu Electric has also acquired 1.83 percent of Chevron Australia’s equity share in the Wheatstone field licenses and a 1.46 percent interest in the Wheatstone natural gas processing facilities. Environmental stewardship is a key element to how we do business. It is part of The Chevron Way values and underpins all of our operations, worldwide, including our development of the Wheatstone Project. The Wheatstone Project has undergone a rigorous and thorough environmental assessment which included extensive research, engagement with communities and government agencies, and contributions from independent experts. A range of environmental monitoring and management programs are in place to protect marine fauna and sensitive benthic habitats.